Aside from patented duos such as Fischli & Weiss, art world collaborations are pretty rare, rarer still among the higher echelons – the drive and ego needed to succeed means that sharing the crayons is an impossibility for most. 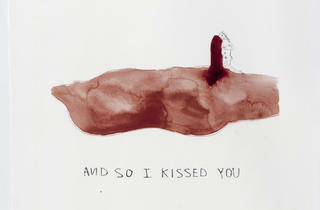 So it’s quite something to see ‘Do Not Abandon Me’, an alliance between Louise Bourgeois and Tracey Emin. Both, it’s true, inhabit common creative ground but each leaves you in no doubt that their art springs directly from the depths of their own experience. And that kind of motivation is seldom up for negotiation. Completed shortly before Bourgeois’s death last year, the prints on show in Hauser & Wirth’s smallest, plushest space began life as simple gouache paintings by Bourgeois, which were passed to Emin. Emin, by her own admission, was nervous ahead of the task, yet the senior artist’s male and female forms – pregnant torsos and prominent tumescences the colours of berries or bruises – seem ripe for the younger artist’s inscription. And, consisting of texts and small figures that turn these partial figures into psychological territories, Emin’s responses feel like completions rather than mere additions. There are elegies and angry poems – birth, death and motherhood prominent subjects as you would expect – but Emin is on playful form, evidently enjoying the jumps in scale afforded by the templates set down by Bourgeois. How much of a collaboration is this? There’s not much of a sense of one artist addressing the other, less still of an evolving dialogue. It would have been great to see the works passed back and forth (the project took place too close to the end of Bourgeois’ life for that to occur) and to see the original works rather than the resultant prints. The abiding impression, though, is a powerful one – the colour bleeds of Bourgeois’s forms and the tailing off of Emin’s scratchy line combining to give a sense of things sliding from view.